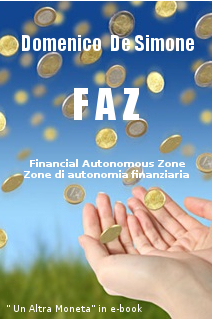 The FAZ, FINANCIAL AUTONOMOUS ZONE is an alternative economic system based on abundance rather than scarcity. The objective of the FAZ is to create communities among people who share values, economic and social relationships and productive activities, providing them a legal tool of exchange like a “complementary currency”. The FAZ is a concrete proposal for a structural economic change through an innovative and sustainable socio-productive model of aggregation, based on participation, which facilitates the creation of wealth and its social redistribution both, providing support, protection and development of the local economy, protection of economically weaker sections of the local population and funding increase of public utility services, without increasing debt. basic income periodically distributed equally to all participants as a function of the wealth produced in the FAZ. How could be work a FAZ? Watch this video to know a similar experiment done during the Great Crisis of 1929. FAZ project is one of the P2P Foundation most important P2P-related projects and trends of 2013.